Please encourage your students to consider agricultural education as a career, because without them, there won't be enough ag teachers to keep our programs going. Use these resources to celebrate & bring awareness to the career of agricultural education, whether it's on Teach Ag Day or any day. For details on any of these activites, just click the link. Check out these great lesson plans to use in your classroom to promote agricultural education, developed by top-notch ag teachers in Missouri as part of their 2017 National Teach Ag Day celebrations! Click here to download the zip file. Use the outlines coupled with the lesson plans below to make Teach Ag Day planning easy. Have a student who you think would be a good ag teacher? Send them a Teach Ag Kit! Set-up a PALS program in your school or make arrangements for students who are interested in being an ag teacher design and present lessons to the elementary and junior high on agriculture. Bring in representatives from the ag education department at the colleges in your state that offer ag education. Use the college finder here on the Teach Ag Website for a listing of universities. Hold an appreciation event for all the other agricultural educators in the region/district. Have ag ed students write a letter to their high school principal, superintendent, or other administrator thanking them for having an ag program and talking about how their ag teacher has influenced their lives. Contact local high school ag programs and ask if you can be part of the National Teach Ag Day celebration in their school. Invite ag ed undergraduates to your summer ag teachers conference and offer workshops designed for undergraduates and first year teachers. Recognize senior students who will be majoring in ag education on stage at the State FFA Convention. Contact Ellen Thompson for more information about Teach Ag Signing Events. Implement a Teach Ag CDE at your State FFA Convention. Have students create mini commercials about their ag teacher and show the commercials at convention or at the summer ag teachers conference. Organize a visit to your state legislative body on Teach Ag Day to talk with lawmakers about agricultural education and the importance of ag teachers in your state. Use NAAE's Legislative Action Center to help plan your visit. Mentor and connect with new teachers in your state to encourage them to stay in the profession. Twitter: Challenge yourself to share an agricultural education story in 140 characters or thread your story throughout the day with multiple tweets. Tag us with @Teach_Ag or use hashtag #teachag. Follow the Teach Ag feed to stay up to date with ag ed, learn about scholarship opportunities, or stay focused on your goals of becoming an agriculture teacher. Facebook: Tag your friends to Teach Ag with a status update, or write your ag ed story as your status or on our Facebook wall; don't forget that you can tag your local program, agriculture teacher, media, and supportive local businesses with the @ symbol and their name. You can also post to your legislator's Facebook wall. Don't forget that you can use Facebook to facilitate event planning. "Like" the Teach Ag page to stay up to date with ag ed, learn about scholarship opportunities, and stay focused on your goals of becoming an agriculture teacher. Agriculture is the nation’s largest employer with 28 million jobs. Thanks @[your instructor] for giving me career skills! Today, I’m tagging @[insert student] to teach ag! @[insert friend], I’m tagging you to teach ag! Blog: Write a blog post about agriculture education and send us the link. What role does agricultural education play in your community? Think of your current ag program, alumni groups, local businesses, industry supporters, and those who might not even realize the connection. How has agriculture impacted your life? Why are you studying to be an ag teacher or why did you become one? What the one thing that you wish everyone knew about ag education? Should STEM change to STEAM? Video: Post a video to SchoolTube or YouTube and send us the link. Alternate facts and a story. When your students board cash bus, they instantly become contestants answering tough agriculture-related questions. Several versions are included in the package, or you can change the answers and questions on the template and use as a review tool for any subject. Download the game. Are You Smarter Than Your Ag Teacher? Use this Powerpoint game to challenge your students. A fun way to get them thinking about the knowledge and skills required to become an agricultural educator. You can also change the answers and questions on the template and use as a review tool for any subject. This Flash-based game uses answers collected from ag teachers all over the United States. 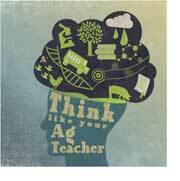 Another fun way to get your students thinking about what it's really like to be an ag teacher. Questions range from "What is your least favorite subject to teach," to "What item do students most often forget to bring to class?" and everything in between. Pose a question to the class relating to the profession of Ag Education, either orally or use the PowerPoint on the Teach Ag Website and modify as needed. The students will write down what they think you would do. At the same time you write down what you would do. After 10-20 seconds have students hold up what they think you would do, then hold up your answer. Students who have the same answer as you get a point. The students with the most points get a prize to be determined by you.